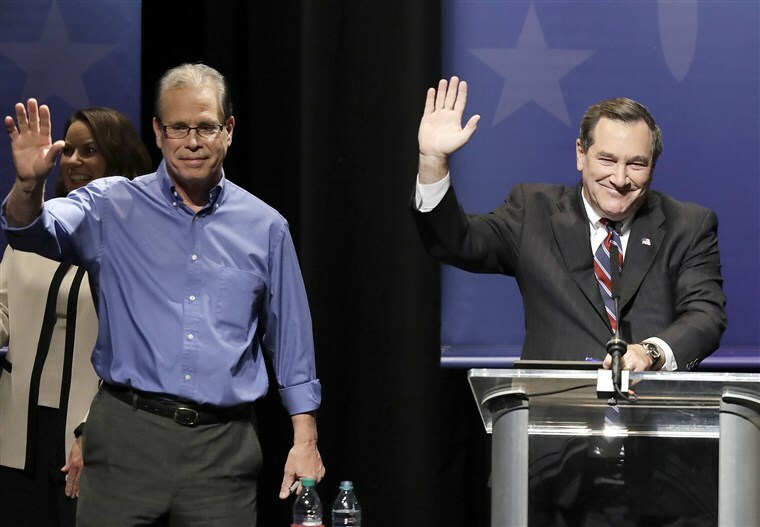 Mike Braun (left) defeated Joe Donnelly (right) in the Indiana US Senate race. Photo courtesy NBC News. Republican Mike Braun defeated incumbent Sen. Joe Donnelly for Indiana’s United States Senate seat that was up for grabs in the midterm election. Multiple news outlets called the race around 9:20 p.m., and Donnelly conceded victory around 9:30 p.m.
Donnelly, who will not serve as an elected official for the first time since 2007, spoke for two minutes and pledged to help Braun transition into the Senate. Braun served one term in the Indiana House of Representatives and is a business owner from Jasper. His opponent was a one-term senator. Before that, Donnelly served in the United States House of Representatives. Donnelly was the first incumbent to lose re-election in the midterms. As for how the election results impact Butler directly, it’s hard to tell. Generally, college campuses lean democratic, and Butler is located in a more democratic city within a republican state. James Cecil, president of Butler College Republicans, said she believes the university’s republican-leaning donor network will help Butler stand on its own. While many students come from Indiana, Taylor Dickerson, vice president of Butler College Democrats, points out that a lot of Butler students come from out of state. She said she is unsure how the election will effect individual students not from Indiana. The loss means that there are no Democrats in a statewide elected office in Indiana. Cecil said she sees that as an opportunity for all of Indiana’s representatives to work together. “I I think it will show both Indiana voters and furthermore United States voters that when you do have a group of elected officials that work together in the House and the Senate that is when the job is truly going to get done,” she said. Braun’s election will add to a larger Republican majority in the Senate, while the Democratic Party will take control of the House. The Indiana Senate seat was seen as an important election. President Donald Trump made four trips to Indiana to rally for Braun, and former President Barrack Obama visited Indiana to rally for Donnelly. Braun will start his six-year term in the Senate in January. News editor Meghan Stratton contributed to this story.